Following my bank holiday Sunday experiences with traffic yesterday I opted for the back way to today’s show. Just as well, the traffic was queued up for miles on the A47 approach whilst there was no queue at all my way. I arrived at about 9:45 and I’ve never seen it so packed with classics. In the end the organisers had to create an overspill into the public parking area. First, a trip around the auto jumble (how do some of the stallholders expect to recoup the standing fee with what they bring to sell?). Nothing of Mayflower ancestry in evidence, of course. Then a coffee and a sit down in the sun. Next a tour of the classics on display, followed by a much needed sausage bap with an ice cream for dessert. 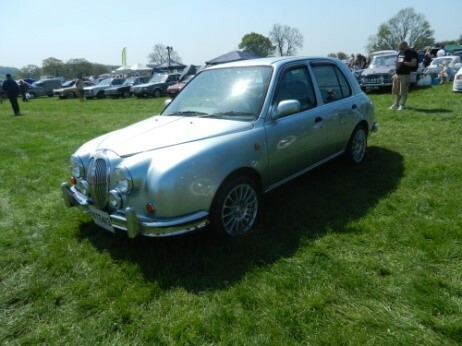 Saw an interesting concoction – what looked like a Mk II Jaguar front married to a Nissan Micra rear! Someone told me that Nissan made them.